Six hundred newly forming stars are crowded into intricate filaments of gas and dust that makes up this stellar nursery, seen for the first time by ESA’s Herschel space observatory. This cool space wallpaper shows six hundred newly forming stars are crowded into intricate filaments of gas and dust that makes up this stellar nursery, seen for the first time by ESA’s Herschel space observatory. 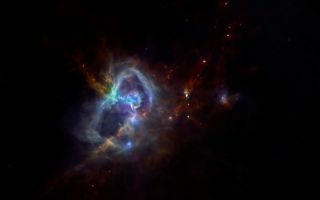 The nebulous area coloured in blue, known as W40 or Sharpless 2-64, is roughly 1000 light-years away in the constellation Aquila, and is about 25 light-years across. It is a vast cloud of hydrogen gas, illuminated by the radiation streaming out from at least three young massive stars embedded in the cloud.